Our Catalog features hundreds of styles. Prices include the printed t-shirt or accessory. Bear Factory sells custom plush toys and personalized teddy bears at wholesale prices. Order personalized stuffed animals with printed t-shirts, vest, bandanas or choose from dozens of other accessories. 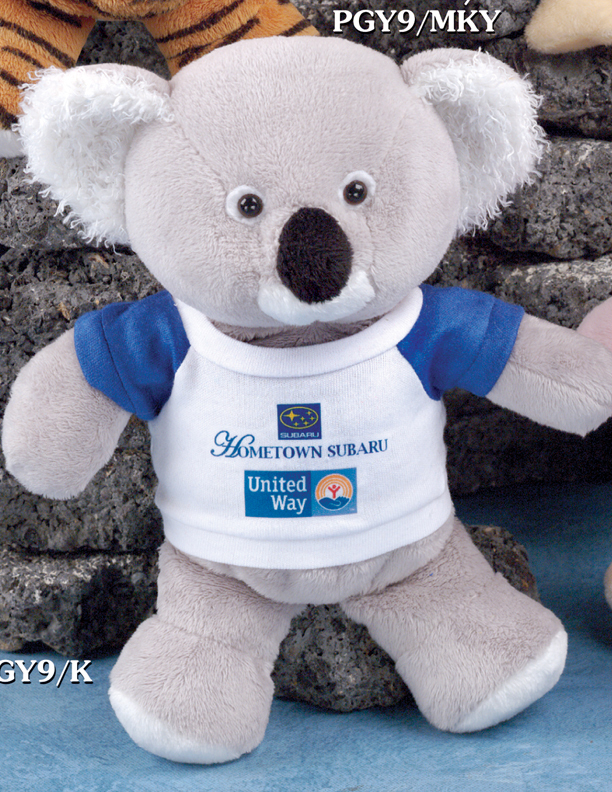 Our teddy bears are great for corporate promotional giveaways, school fundraising events and charity promotions. Our online catalog features over 300 teddy bears and 200 other styles of stuffed animals. We also offer teddy bears that you stuff yourself. Teddy Bears that your build yourself are popular for schools, museums and youth groups. We provide the materials and you build the bear. Each kit includes the bear skin, the poly fill, a custom printed t-shirt or accessory, a birth certificate and a heart. The lead time for production of the bears that you build yourself is 14 days. 10" Elrud Bear Panda on Page 3. 6" Jamie Bear on Page 15. 9" Koala Bear on Page 33. 1. In Stock: Animals ordered from our online catalog have a lead time of only 10 - 14 working days. 2. From China: Embroidered Teddy Bears and custom stuffed animals are made in China and require a lead time of 90 days. This does not include holidays like Chinese New Year and other Chinese holidays. Ordering personalized Teddy Bears from our company is easy. First, you should look through our online catalog and find a bear or stuffed animal that you like. Then send us an email that indicates the item number of the plush toy you want to order along with your shipping address and logo. We will then reply with a .pdf Invoice that includes the cost of freight to your shipping address. All artwork should be high-resolution. Please refer to our Artwork Specifications page to determine the best method for emailing your artwork. Visit our online catalog to see the many styles of teddy bears and stuffed animals for sale. Most styles are available in different sizes. 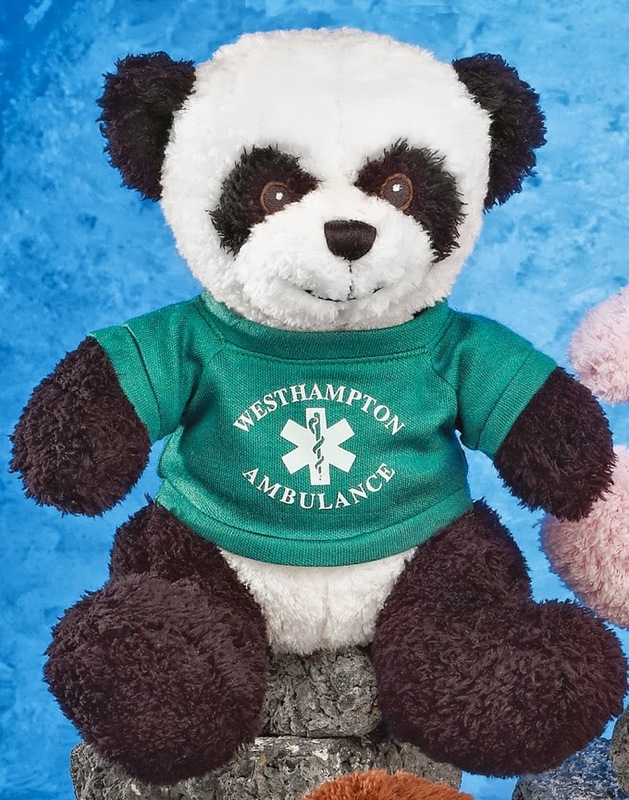 We also offer many colors of personalized t-shirts for the Teddy Bears. If you have an imprint that requires multiple colors, we suggest using a white colored t-shirt. This allows us to print the multi-colored logo at the lowest cost to you. The is an additional charge for multi-colored imprints onto a white t-shirt. Normally, the lead-time for production at Bear Factory is 10 -14 working days. We do offer RUSH service for stuffed animals wearing a white colored shirt. We can imprint these shirts in our warehouse and offer a quicker turnaround time. Please mention that you need your order rushed. We ship using UPS ground service. If you require faster delivery, we can provide a quotation for delivery based upon your needs. Bear Factory sells custom plush toys and custom teddy bears. Order personalized stuffed animals with printed t-shirts and bandanas. Copyright 2019 GIFTCO. Site Map.